The manufacturer initiative to save our soil globally we are creating one of the strongest and original money back guarantee specifically on organic liquid fertilizer the first of its kind in fertilizer. Our organic liquid fertilizer is the key for global sustainability and we have made a major commitment to give you the protection and the guarantee to try our 100% organic liquid fertilizer brand. Our 100% organic liquid fertilizer is guaranteed to save our soil. 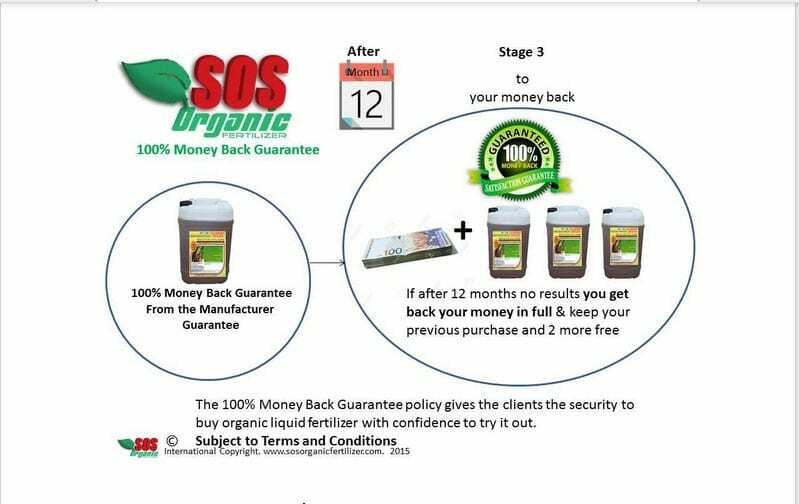 As we have decided to give an UNBEATABLE 100% genuine manufacturer money back guarantee on our pure 100% organic liquid fertilizer. These 100% money back guarantee policies give you the client the security to by it and try it. and we will honor any genuine complains that qualify with in our terms and conditions .We at SOS look forward to our very first request for our full money back guarantee because this was set in place a series of very important research and development project that will be only further our understanding our liquid application and product development improvement processes. We have a process for you to qualify to get your cash or your money back GUARANTEE. In the beginning we will only give your money back only subject to you getting 2 times your liquid fertilizer back first. Example, if you buy 100 tons and requests online for your money back guarantee process than we will allow you to pick up at our authorized distribution center only in Sabah. KK x farm . for now. With the conditions you have to provide your own Liquid liquid containers your our full 100 tons for free. This is process 1 of a 3 step process under our terms and conditions.so we have the rights to monitor your liquid fertilizer application rate at your land location. Naturally we need prove that you are actually placing the liquid fertilizer on your plant correctly. We have the rights to photograph the before and after. And the rights to do a soil and plant analyses, subject to your fertilizer volume . including customer location we may not conduct a full research on the first free delivery stage 1. We have a time frame for the fertilizer to show results on the 1st free applications. After 8 months if the clients still request their money back guarantee than the same process is repeated. They YOU WILL have the rights than to have one more free ( 100 tons example only ) of liquid fertilizer. Example, this time SOS may investigate or pursue our rights under the guarantee terms to cooperate with the client so we can witness the fertilizer application on the tree and we have the rights to our investigation and conduct soil testing analysis just so we can understand the complaint and problem much better. 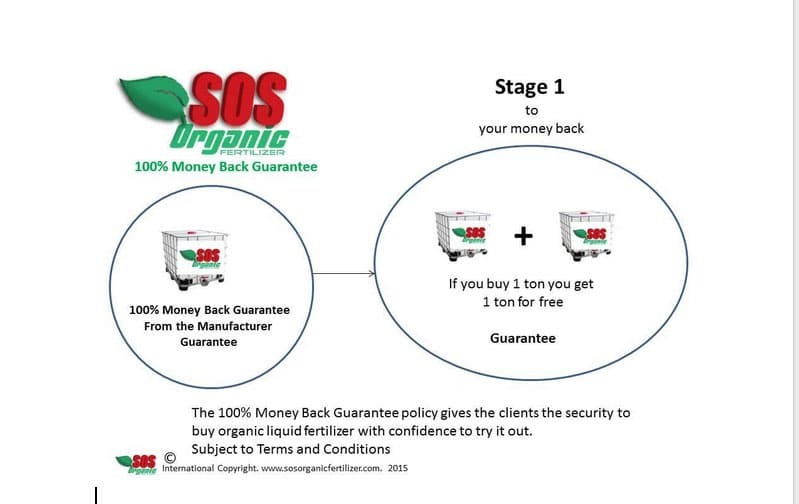 All the cost of the soil testing analysis will be bear by SOS Organic Fertilizer. We are so generous so surely some people will take advantage of the situation so the 20 months of monitoring is necessary considering we will not say no to the free fertilizer replacement former complain. 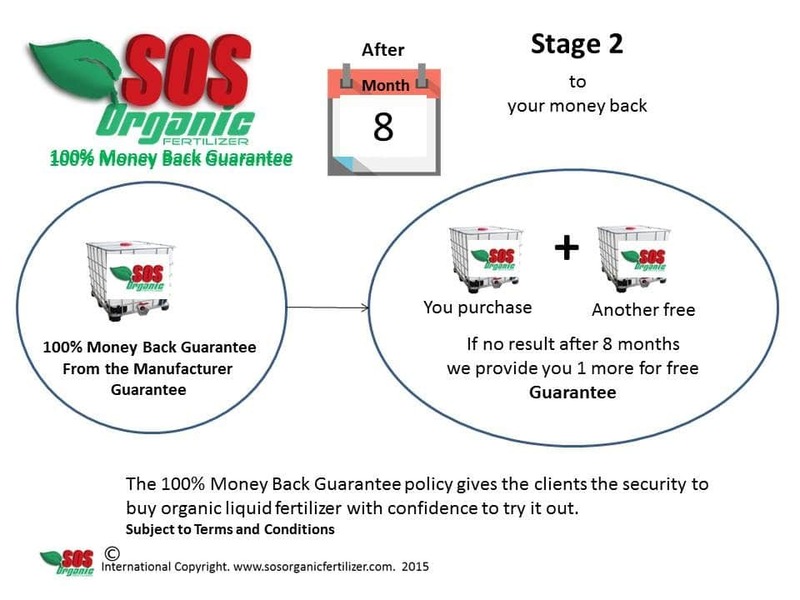 This is a very powerful opportunity for clients who want to do the wrong thing by our money back guarantee that is why we must have clear terms and conditions to qualify because as you know already many people will take advantage even though our liquid fertilizer will be working so good. Some People will want free products ANYWAY regardless of result. Some can possibly take and sell it and not apply to their crops nevertheless it worth our trouble .We will follow up in detail so that the true facts are reveal in regard to the application and the total volume of fertilizer that have been applied. We have the biggest locally manufacture high grade organic liquid fertilizer. Our focus and aim is to develop a very powerful testimony portfolio and takes complain extremely serious and learn and develop from them. The examples of fertilizer mention is to show am example of how our guarantee works. 1 1st free batch of fertilizer pick up we request for 8 months after your fertilizing to demonstrate and prove to you of it effectiveness. This time is necessary considering it natural pure 100 micro base natural fertilizers. If you are not 100% satisfied you go to stage 2 Customer must fill up the Money Back Guarantee ONLINE Form.We have the right to send an investing officer to the farm to investigate and to check the application of the fertilizer is done correctly and check on the progress. 2 2nd free batch of fertilizer is given and pick up we for request 12 months of fertilizing for the result.The second free batch is now available it is the last free liquid fertilizer to be given. We request 12 months after this receiving this second free batch to demonstrate the true result if for any reason you are not fully satisfied after this than you automatically go to stage 3. We have the option to send a consultant fertilizer officer to visit your land to monitor the progress and to document the application and process to check that it has been properly applied. 3 After 1,2 stage and we find that there is no improvement we will then back guarantee 100% money policies to give back to you. Our final process you will now receive your full money back guarantee to achieve this you would had 2 free batches of fertilizer and the time to monitor the progress of our fertilizer due to our commitment and guarantee if you are still not satisfied we will not hesitate to refund your money in full. Please note that the full 20 months process must be taken and on an online request to claim and get a full refund. We have the rights to document and to show our observation. In the beginning we will only give your money back only subject to you getting 2 times your product back over 20 months. Example your first free pickup needing 8 months for trail and testing if not happy you received another batch we are requesting no less than 12 months after 20 months you have the rights to request for your money back. 1 liter no order too big or too small. Our observation and monitoring of the fertilizer result will come back to the client. It is more than fair for us to support the client and to give assistance and advice on the application and to demonstrate or reveal our finding of positive new growth that is cause by the result of our organic liquid fertilizer. Our product is so high in natural microorganism it is a living medicine for the soil. When the soil is sick due to the use of chemical under the Dead Soil Syndrome (DSS) it takes time for nature to recover and the soil to soften and the pH to adjust unlocking tie up elements and mineral. Our product is guaranteed to work that why we give this money back guarantee. Stage 3 You get 100% of your money back guarantee and your keep your 2000 ton also for free.